I grew up with a tablecloth on the table -- always. Whether it was breakfast or lunch in the kitchen or dinner in the dining room. Real cloth napkins as well --used for more than one meal before they were washed, lightly starched and ironed to perfection. My mother would never serve a meal on a bare table as she would never go outdoors without clothes! I like tablecloths, too. 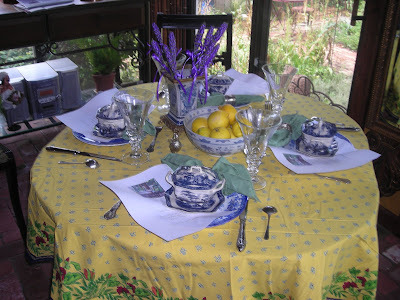 For the breakfast room table, we have several and the table is never without it's tablecover. Whether it is just us or company, napkins are always put into the collection of silver napkin rings that I've managed to acquire over the past 20 years. Husband Jim started the collection when he bought a box of silver trinkets and inside were two napkin rings -- one with a name and the other with initials. For us, we do use our napkins for more than one meal, putting them back into the napkin ring and slipping them into a drawer in the baker's rack in the sunroom. 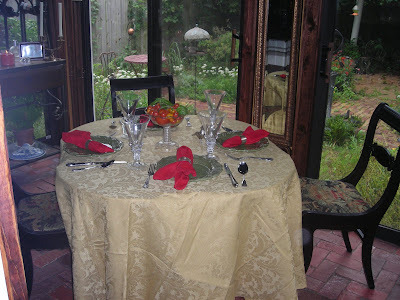 I think tablecloths add a finishing touch to a table much as earrings or a pin add that finishing touch to an outfit. I don't have scads of tablecloths but I do have enough so that there is always a clean one on the table. 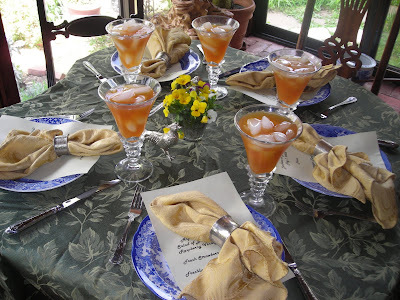 I did notice, growing up, how nice a table looked with a tablecloth and real cloth napkins. I think my mother would be proud. Indeed she - your Mom - would be pround. You set a beautiful table, Martha. What a beautiful table! I'm sure your mother would be proud. I wish I could say I iron the cloth napkins around here... maybe when I don't have a toddler!